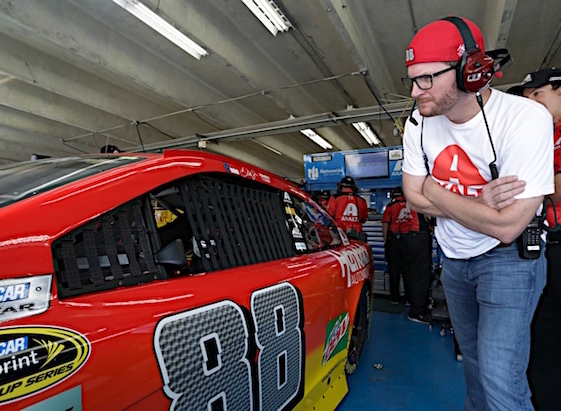 CONCORD, N.C. – Prior to mid-July, Alex Bowman wasn’t a familiar name to most race fans. The 23-year-old Arizona native had enjoyed success in ARCA, winning six races in 21 starts over a two-year period, but when it came to NASCAR he possessed no victories. He had produced top-five and top-10 finishes in NASCAR’s K&N Pro Series East and West and Xfinity Series, but none in the Sprint Cup and Camping World Truck series. Yet, Bowman caught Dale Earnhardt Jr.’s eye. In seven Xfinity races this year for JR Motorsports, he has yet to finish outside the top 10. His best finish came at Dover in May when he placed third. It was mid-July, however, when Bowman’s career took a different turn. At the time, Earnhardt was suffering from concussion-like symptoms and needed a substitute. Bowman was summoned to step into Earnhardt’s Hendrick Motorsports Chevrolet for the July 17 New Hampshire race. He qualified 20th and finished 26th. Nothing to brag about, but then came a top-10 finish at Chicago last month and a front-row starting position for this weekend at Charlotte Motor Speedway. In qualifying Thursday night at the 1.5-mile track, Bowman nearly claimed the pole with a 196.000- mph lap. Kevin Harvick was just a tick better at 196.029 mph. Bowman noted it was Earnhardt who saved his career two years ago when he gave him a chance in an Xfinity car. Since being named to substitute for Earnhardt Bowman has split time with four-time NASCAR champion Jeff Gordon, who Hendrick called out of retirement. By the time the season concludes, Bowman will have competed in 10 Cup events. However, his plans for the 2017 season remain uncertain. “There are not really any rides open next year, so these races may be the rest of my Cup career,” Bowman said. “You never really know what the future holds. The one thing I said I was going to do throughout all of these races was to make the most of it and to have the most fun I possibly could. I’m not going to let the pressure kill me. I’m not going to let the people on social media dictate how I feel when I go home at night.